Tom Wood wears black high top Converse “Chuck Taylor” All Stars in the film. The U.S. Marshal warrant squad makes the 6 O’Clock News after a successful bust. U. S. Marshals is actually a sequel to the successful film version of The Fugitive. There is no Harrison Ford, and instead the movie focuses on Chief Deputy U.S. Marshal Sam Gerard (Tommy Lee Jones). Jones plays Gerard in his very polished “high ranking government official who knows how to use the system and does” mode. Jones has played this type of character many times in recent years, as we have seen in The Client, Men in Black, The Fugitive, and now U.S. Marshals. This time, instead of tracking the escaped Dr. Richard Kimble, Gerard is tracking Mark Sheridan (Wesley Snipes) who is wanted for the murders of two government agents in New York. Another difference is that you see Gerard working with a team of deputy marshals, Cosmo Renfro (Joe Pantoliano), Cooper (LaTanya Richardson), Biggs (Daniel Roebuck), and Noah Newman (Tom Wood). Noah, and Chief Deputy Sam Gerard find evidence in the plane wreckage. After some opening sequences that establishes the M.O. of the warrant squad as they bust two dangerous fugitives, and introduces us to Mark Sheridan through a spectacular truck crash sequence in downtown Chicago, the film starts to settle into its main story line. Gerard is told by his boss, U. S. Marshal Walsh (Kate Nelligan), that he must fly on the prisoner transport plane that is flying both Sheridan and the fugitives that Gerard arrested to a Missouri penitentiary. But during the flight, one of the prisoners gets access to a planted gun and tries to kill Sheridan. In the ensuing struggle, the gun fires, shooting a gaping hole into the side of the aircraft, and forcing it to crash land at the edge of a Tennessee swamp. Sheridan escapes in the turmoil, and soon Gerard is assigned to head the massive search to find him. Soon we discover that Sheridan is a not another ordinary criminal, but a trained government special agent which he proves by the clever ways in which he keeps eluding Gerard’s team. He has resources of his own which include his girl friend Marie (Irene Jacob) who appears at convenient times to help him out of trouble. Another complication occurs when the State Department gets involved with the search, and sends an agent named Royce (Robert Downey, Jr.) to work with Gerard’s team. 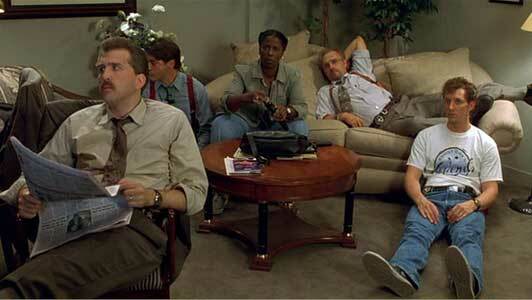 The agents relax in their New York hotel room waiting for a break in the case. The ending part of U. S. Marshals contains a series of chase scenes, first in the swamp near the plane crash, and then in New York City at a cemetery, and in a retirement home. The marshals continue to pursue Sheridan in spite of evidence revealed throughout the film that something else is going on: the attempt to kill Sheridan on the plane, the discovery of a videotape showing what really happened, a second attempt to kill Sheridan at the cemetery by a Chinese agent, the revelation by the state department people that there is a traitor in their organization, and finally Gerard’s acknowledgement that “This is a ruthless assassin who keeps going out of his way to let people live”. Eventually, things get figured out, but really too late, long after most of the audience has already figured out who the real villain is. 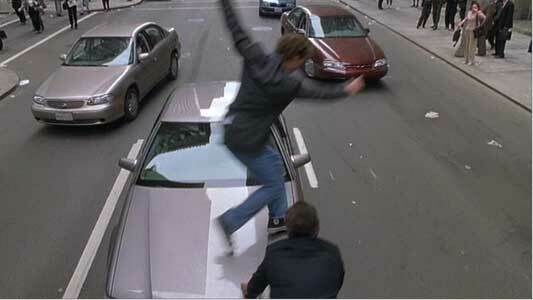 Noah and Sam take over a car in hot pursuit of the suspect. U.S. 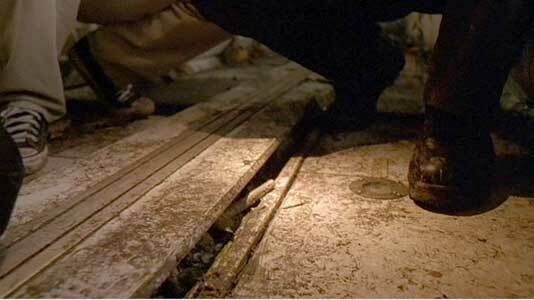 Marshals has some spectacular stunts and clever special effects sequences. But it borrows so much from The Fugitive plot that the audience can pretty much figure out what is going to happen before the marshals do. Tommy Lee Jones and Wesley Snipes do justice to their roles, and its nice to see some emphasis put on teamwork by giving the other deputies something to do and keeping them involved in most of the action. A lot of the story line seemed designed to just create a vehicle for more stunts and special effects, rather than to develop any characterizations of any depth. Too bad, because there was a lot to work with here. Some tighter editing on the script could have easily eliminated about 30 minutes from this film, and perhaps ten or fifteen minutes of that could have been used to show some of the other marshals as more than just a last name that Deputy Gerard barks orders to. 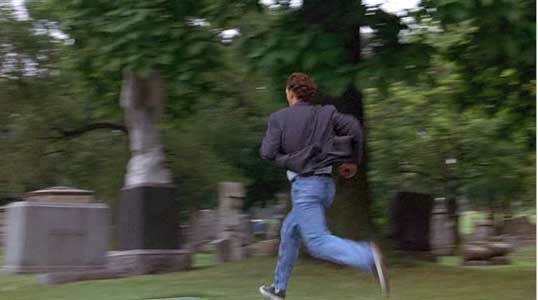 Noah runs through a cemetery in pursuit of fugitive Mark Sheridan. 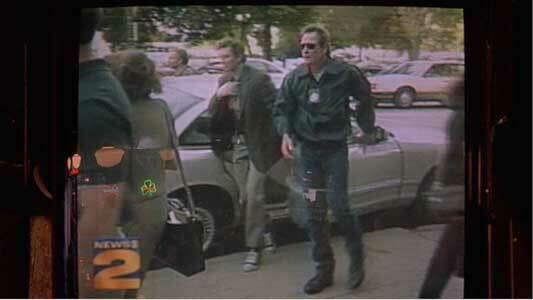 We see Tom Woods in his role as deputy marshal Noah Newman wearing his black high top chucks through out the film. It’s nice to see a break from the standard suit only attire usually associated with federal law enforcement officials. Unfortunately, we never get to find out much about what kind of person he really is. The best chucks scenes are during the New York chase sequences that Woods appears in, running through the streets, leaping off of cars, and hustling through building corridors. 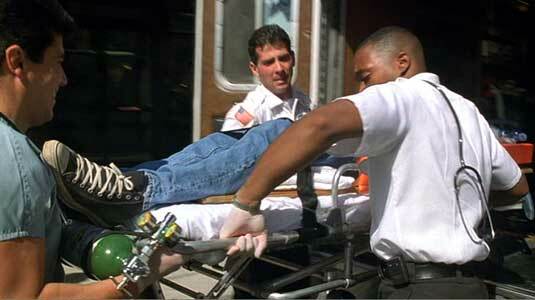 Sadly, the best close up shots occur when he is being taken to the emergency room in an ambulance after being shot. A real tough day at the office for Noah. U.S. Marshals. (1998) Tommy Lee Jones, Wesley Snipes, Robert Downey, Jr., Joe Pantoliano, Kate Nelligan, Tom Wood, Lorenzo Clemons, Ray Toler, LaTanya Richardson, Irene Jacob. Directed by Stuart Baird. Categories: Drama, Crime and Mystery, Action/Adventure.